P1170. 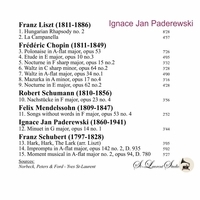 IGNACY JAN PADEREWSKI: Liszt, Chopin, Schubert, Schumann, Mendelssohn & Paderewski. Yves St Laurent YSL 78-253, recorded 1911-37, incl. 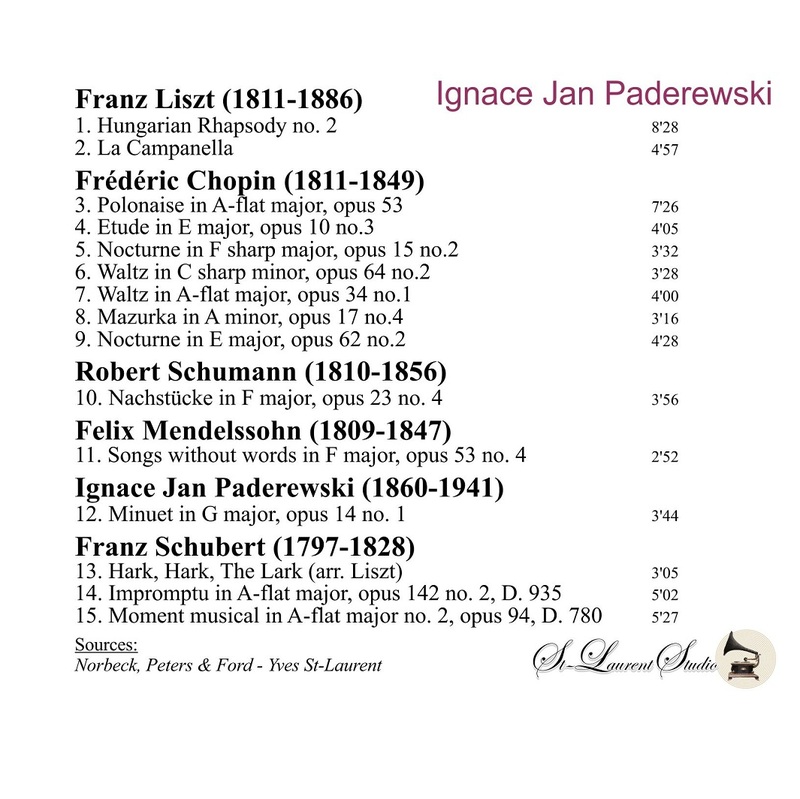 Paderewski's recordings made at Chalet Riond-Bosson, Morges, Suisse. Transfers by Yves St Laurent. 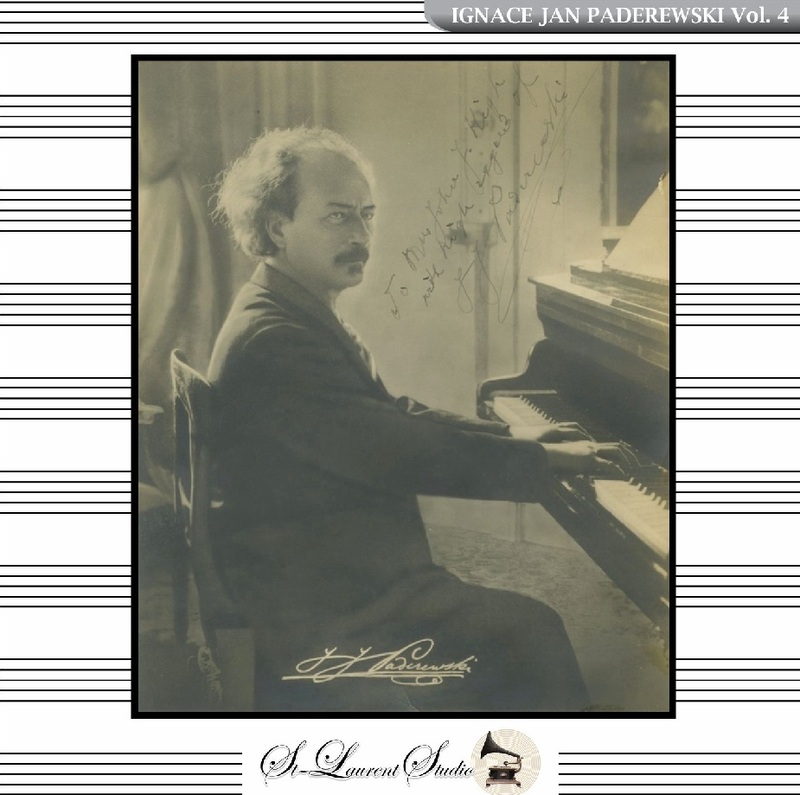 “Ignacy Jan Paderewski was a Polish pianist, composer, diplomat and politician, and the third Prime Minister of Poland. He is sometimes referred to by the German version of his name Ignaz Paderewski. He was also a substantial composer, including many pieces for piano. In 1901 his sole opera MANRU received the world premiere at Dresden, then it had American premiere in 1902 at the Metropolitan Opera and to this day remains the only Polish opera by a Polish composer ever performed there. During World War I, Paderewski became an active member of the Polish National Committee in Paris, which was soon accepted by the Entente as the representative of Poland. He became a spokesman of that organisation and soon also formed other social and political organisations, among them the Polish Relief Fund in London. In 1922 he retired from politics and returned to his musical life. His first concert after a long break, held at Carnegie Hall, was a significant success. He also filled Madison Square Garden (20,000 seats) and toured the United States in a private railway car. His position as Prime Minister of Poland lionized his career. By 1936, 2 years after the death of Mme. Paderewska, Paderewski consented to appear in a film presenting his talent and art on the screen. This proposal had come at a time when Paderewski did not wish to appear in public as described by Aniela Strakacz. However, the film project did proceed and the selected film script was rather an opportunity to feature Paderewski. The alternate choice had been more Polish in theme. Therefore MOONLIGHT SONATA would be filmed throughout 1936. In November 1937 Paderewski agreed to take on one last pupil for piano. This musician was Witold Malcuzinski, who had won second place at the Chopin Competition. First place had been awarded to the Russian, Uninski.